Allergies. Yup, that’s why my eyes are glistening. Damn pollen. Okay, fine. You caught me. It’s not flora triggering my tear ducts–Drake fulfilling a fan’s wish to meet him is definitely doing the trick. The jury’s still out on Kiki’s affections for him, but Sofia Sanchez is definitely feeling Drake after the “God’s Plan” rapper surprised the 11-year-old heart condition patient with a hospital visit on Monday. Drake dropped by Lurie children’s hospital in Chi-Town, a week after Sofia–who is battling cardiomyopathy and seeking a heart transplant–took the “In Your Feelings” challenge, asking him to visit. This is by far the cutest plug ever with Sofia rocking Scorpion cap. For those living under a rock it’s the title of Drake’s latest album. Long live the king of the South, especially if he continues to be this generous. Rapper TI donated a year’s worth of lunch money to University High School sophomore Danielle Aiken, after learning on Twitter the Florida teen was denied lunch for being 15 cents short. Like, really? The lunch lady aka Nazi couldn’t let the girl slide this once. Thankfully TI took to Twitter to not only rant about it, but be the solution. Danielle confirmed receiving TI’s blessing to WKMG. And revealed he wasn’t the only one offering to pay her lunch tab. Prompting her to launch a GoFundMe account for students struggling to pay for school lunch. Great way to pay it forward, sis. Just like our girl, Reginae Carter and boo YFN Lucci is doing for Atlanta kiddies. The power couple hosted a Back to School Field Day event in Atlanta’s Grant Park Recreation Center where they handed out backpacks full of school supplies. And of course played games. Reginae and family took part in potato sack races, three legged races. In addition to face painting and bracelet making. To top it off there were food and ice cream trucks. Sounds like a fun-filled day. May your weekend be in the same vein. Drake added another good deed to his ever growing list. The “God’s Plan” rapper used Cupid’s love arrow to strike a 63-year-old hotel maid from Miami with a full day of pampering. According to People, Drake spoiled the housekeeper from Fontainebleau Miami Beach with a $10,000 Saks Fifth Avenue shopping spree. Drake told the Miami native she could have whatever she wanted in the store. Walking away with $800 flats, a $2,000 Valentino handbag, four perfumes and a $6,000 18-karat, white gold necklace with diamonds. Before getting a massage in her own hotel’s spa. Boss moves, baby. Drake teamed up with Steelers wide receiver Antonio Brown to give fairy God father treatment to Odalie Paret, a mother of five who travels four hours to get to work. Don’t say this superwoman isn’t deserving of this VIP treatment. Drake learned about Odalie’s story by reading about it her in Miami Herald–that focused on city’s increasing rent prices–and wanted to help her. Talk about an epic Valentine’s Day. Guess Drake was rapping about his giving game on “Forever” because he’s seriously on a roll in the 305. On Monday he was writing checks to a college student and Miami Senior High School. On Tuesday the “God’s Plan” rapper was surprising shoppers at Sabor Tropical Supermarket with $50,000 worth of groceries. According to Wral.com, Drake pulled up to the market with a megaphone announcing his good deed. No doubt the cameras (Drizzy had a film crew with him) caught the delight of the lucky shoppers as he shook hands and took selfies. “No one knew he was coming at all, we just came to do groceries. Cameras were being set up so we were all wondering what was to happen,” shopper Guille Deza told E! News. A real king [went] out and paid for everyone’s groceries in the store, all the while encouraging people to more lol. BE GOOD AND IT’LL COME RIGHT BACK AROUND!!! so much love and bless this man 100 times over for all his generosity,” Deza wrote on Instagram. Drizzy wasn’t done yet. He surprised residents at a local homeless shelter–Lotus Village–and wrote a $50,000 check for the organization. Plus, donated a van…and showered 130 women at the shelter with a $150 Target gift card. And handed out toys and games for the 140 kids living there. Last 3 days were the best I have had in a very long time…there’s nothing like seeing people experience a joyful moment when you can tell they need it the most. Okay, Drake you may be G.O.A.T on giving. Drizzy was “sharing the wealth” all across M.I.A on Monday, when he was in town to shoot his “God’s Plan” video. Btw, the song is already No. 1 on Billboards Top 100 singles chart. But y’all knew that because it’s all over your iTunes playlist. Drake’s first stop was at Miami Senior High School, where not only did he drop off a $25,000 check, but had students set up with OVO-designed uniforms. Let’s just say that was a big fat thank you from Drake for allowing him to shoot his music video at the school. Umm, Drizzy you can always use my apartment for your music videos…I’m just sayin’…if you’re ever in Charlotte…holla at your girl. The “Diplomatic Immunity” rapper also surprised a University of Miami student with $50,000 check to go towards her tuition. Destiny James, who received a few college scholarships, thought she’d be participating in a video shoot chatting up the value of free money for school. Nope! Billboard reports, Drake came out the bushes with a big ‘ol check to reveal the real reason of the shoot. Destiny replayed the moment in her Insta story. Hat’s off to Drake for helping students live their best lives. Rihanna and Drake are a winning combo on the pop princess’ ANTI World Tour–slaying the stage in MIA earlier this month. But their work didn’t stop there. They made one special fan smile a little bit harder when surprising her backstage at Miami’s American Airlines Arena. Megan, a young cancer patient, dream became a reality when meeting her two idols. Now that’s how you kickoff a tour. Oh, Rihanna’s twerk fest on Drake doesn’t hurt either. 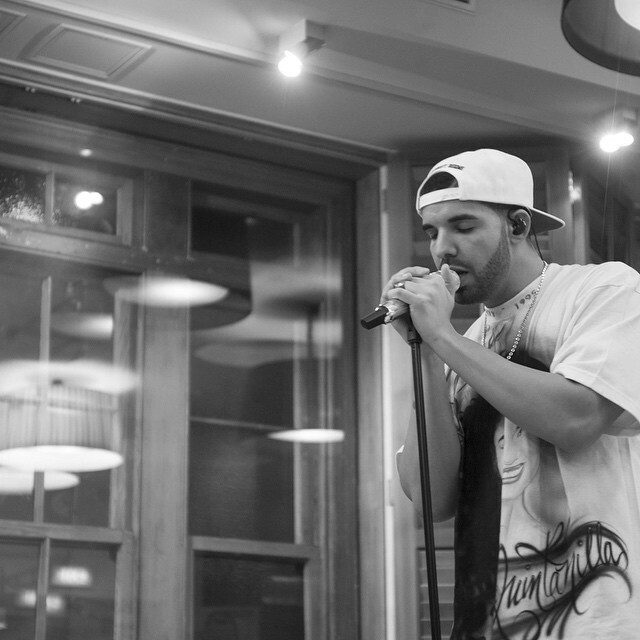 Drake performing in the studio. Now he’s going to give Strawberry Mansion High Schoolers that same opportunity. Strawberry Mansion High School is getting a PR boost from lovesick rapper Drake. He donated $75,000 to open a recording studio for students at the troubled high school that was ranked one of the worst in the country. This is about you. This is about your principal. This is about your future. I love you. I care about you. I want to see you succeed. Now they can in a newly designed booth–Huffington Post reports finished construction last summer–the Strawberry High principal christened; playing a song from the studio over the PA system. Let’s hope they go the way of famous Strawberry high alum Meek Mill. A friendly wager for charity took a turn for the worse between rapper The Game and OKC baller Kevin Durant when TMZ got in the mix of the on-the-fly bet for the kiddies. Okay, so according to TMZ, last week at a Drake party, Durant stepped to The Game with a philanthropic offer: if the “How We Do” rapper could sink a 3-point shot at NBA range he’d give away $20K worth of his sneakers to The Game’s lil league basketball team Frogg All Stars. It was all net for The Game’s charity shot, but never received the deets from K.D. on when the kids gear would be delivered. TMZ got wind of the wager, tracked Durant down during his workout for answers and called out the MC for lying about the bet. Not one to let that slide, the Game blasted the baller out on Instagram about the terms of the bet. He even said Drake was a witness to the charity shot. Had a conversation with @easymoneysniper this morning & we both agreed that there was a miscommunication between the middle party which was “TMZ” & that the way the camera man presented it to him was as if he bet me $20,000 cash which wasn’t the case…. We agreed that if I hit the 3 point shot he would get KD gear & his kicks for all the kids in our @froggallstars organization which is close to 130 children…. 130 kids at a price of maybe $150 a shoe & gear after tax equals close to $20,000 give or take so that’s where that # came from. When I woke up & had multiple texts & calls saying KD called me a liar on TMZ, I acted immediately in clearing things up on my end on my page & didn’t have a # on @easymoneysniper to clear it up privately which is what I should’ve done because the situation that was meant to be friendly & charitable to the kids & is now blown out of proportion…. The Game also wrote that K.D. agreed to make good on the bet’s promise and deliver the gear to his lil league team of over 100 players. K.D. re-posted the Game’s message. So all is squared away. Go Frogg AllStars!! !